I have not in this statement touched upon the financial side of the Congo State. A huge scandal lies there—so huge that the limits of it have not yet been defined. I will not go into that morass. If Belgians wish to be hoodwinked in the matter, and to have their good name compromised in finance as well as in morality, it is they who in the end will suffer. One may merely indicate the main points, that during the independent life of the Congo State all accounts have been kept secret, that no budgets of the last year but only estimates of the coming one have ever been published, that the State has made huge gains, in spite of which it has borrowed money, and that the great sums resulting have been laid out in speculations in China and elsewhere, that sums amounting in the aggregate to at least £7,000,000 of money have been traced to the King, and that this money has been spent partly in buildings in Belgium, partly in land in the same country, partly in building on the Riviera, partly in the corruption of public men, and of the European and American Press (our own being not entirely untarnished, I fear), and, finally, in the expenses of such a private life as has made King Leopold’s name notorious throughout Europe. Of the guilty companies the poorest seem to pay fifty and the richest seven hundred per cent. per annum. There I will leave this unsavoury side of the matter. It is to humanity that I appeal, and that is concerned with higher things. Before ending my task, however, I would give a short account of the evolution of the political situation as it affected, first, Great Britain and the Congo State; secondly, Great Britain and Belgium. In each case Great Britain was, indeed, the spokesman of the civilized world. 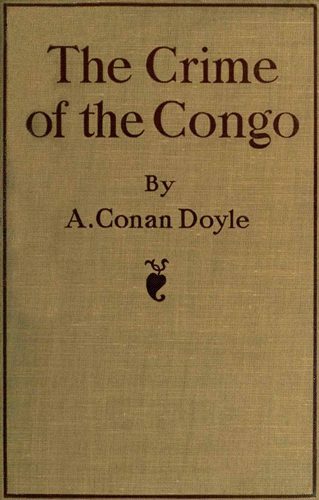 So far as one can trace, no strong protest was raised by the British Government at the time when the Congo State took the fatal step, the direct cause of everything which has followed, of leaving the honest path, trodden up to that time by all European Colonies, and seizing the land of the country as their own. Only in 1896 do we find protests against the ill-usage of British coloured subjects, ending in a statement in Parliament from Mr. Chamberlain that no further recruiting would be allowed. For the first time we had shown ourselves in sharp disagreement with the policy of the Congo State. In April, 1897, a debate was raised on Congo affairs by Sir Charles Dilke without any definite result. In July of the same year there occurred the famous three days’ debate in the Belgian House, which was really inaugurated by the British resolution. In this debate the two brave Reformers, Vandervelde and Lorand, though crushed by the voting power of their opponents, bore off all the honours of war. M. de Favereau, the Minister of Foreign Affairs, alternately explained that there was no connection at all between Belgium and the Congo State, and that it was a breach of Belgian patriotism to attack the latter. The policy of the Congo State was upheld and defended by the Belgian Government in a way which must forever identify them with all the crimes which I have recounted. No member of the Congo administration could ever have expressed the intimate spirit of Congo administration so concisely as M. de Smet de Naeyer, when he said, speaking of the natives: “They are not entitled to anything. What is given them is a pure gratuity.” Was there ever in the world such an utterance as that from a responsible statesman! In 1885 a State is formed for the “moral and material improvement of the native races.” In 1903 the native “is not entitled to anything.” The two phrases mark the beginning and the end of King Leopold’s journey. In 1904 the British Government showed its continued uneasiness and disgust at the state of affairs on the Congo by publishing the truly awful report of Consul Casement. This document, circulated officially all over the globe, must have opened the eyes of the nations, if any were still shut, to the true object and development of King Leopold’s enterprise. It was hoped that this action upon the part of Great Britain would be the first step toward intervention, and, indeed, Lord Lansdowne made it clear in so many words that our hand was outstretched, and that if any other nation chose to grasp it, we would proceed together to the task of compulsory reform. It is not to the credit of the civilized nations that not one was ready to answer the appeal. If, finally, we are forced to move alone, they cannot say that we did not ask and desire their co-operation. From this date remonstrances were frequent from the British Government, though they inadequately represented the anger and impatience of those British subjects who were aware of the true state of affairs. The British Government refrained from going to extremes because it was understood that there would shortly be a Belgian annexation, and it was hoped that this would mark the beginning of better things without the necessity for our intervention. Delay followed delay, and nothing was done. A Liberal Government was as earnest upon the matter as its Unionist predecessor, but still the diplomatic etiquette delayed them from coming to a definite conclusion. Note followed note, while a great population was sinking into slavery and despair. In August, 1906, Sir Edward Grey declared that we “could not wait forever,” and yet we see that he is waiting still. In 1908 the long looked-for annexation came at last, and the Congo State exchanged the blue flag with the golden star for the tricolour of Belgium. Immediate and radical reforms were promised, but the matter ended as all previous promises have done. In 1909 M. Renkin, the Belgian Colonial Minister, went out to inspect the Congo State, and had the frankness before going to say that nothing would be changed there. This assurance he repeated at Boma, with a flourish about the “genial monarch” who presided over their destinies. By the time this pamphlet is printed M. Renkin will be back, no doubt with the usual talk of minor reforms, which will take another year to produce, and will be utterly futile when[Pg 117] reduced to practice. But the world has seen this game too often. Surely it will not be made a fool of again. There is some limit to European patience. “Moral regeneration of the natives!” Moral regeneration of his own family and of his own country—that is what the situation demands.